I don’t always agree with Susan Collins. But she has my vote. 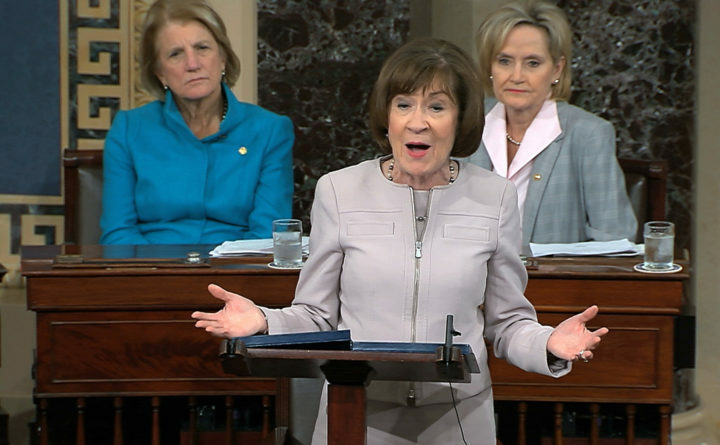 In this Friday, Oct. 5, 2018, file image from video provided by Senate TV, Sen. Susan Collins, R-Maine., speaks on the Senate floor about her vote on Supreme Court nominee Judge Brett Kavanaugh, in the Capitol in Washington. There are a lot of bad feelings going around concerning Sen. Susan Collins. I would like to address those bad feelings. I personally voted for Collins and will do so again. I did not vote for someone to go to Washington and follow the party line or do what the president says to do. I did not vote for a yes-woman. I did not vote for someone to take a poll of her constituents and then vote with the majority. I voted for someone whom I believed would go to Washington and do what she thinks is best for the nation and for Maine, using her experience and knowledge. In my eyes, Collins was that person and continues to be that person. She has continued to vote, not how everyone says to vote, but as she believes is best for the nation and Maine. If this meant crossing party lines, she was willing to do so, even if it upsets her own party. Collins has shown character and integrity, and I question how many of her detractors have shown her the same. Have I always agreed with her? Of course not. However, I did not vote for her because I always agree with her. I voted for her because of her character and integrity. Does she make her own party mad? Of course she does. That is one thing I like about her. She is willing to stand her ground when those around her are caving. In 1941, Jeannette Rankin, R-Montana, stood alone as the sole vote against the U.S. entrance into World War II. She believed this was a knee jerk reaction to the bombing at Pearl Harbor and needed further consideration. Was this vote a bad idea? On one hand, it essentially ended her political career. But on the other hand, she stood up for what she believed in — even when all those around her were telling her not to do so. A good leader frequently makes others mad, including others within their circle. Even George Washington had his detractors and made decisions that made others question his loyalty, including when he signed the Jay Treaty with Britain during the French Revolution. Collins is cut of this same cloth and is the type of person I want representing me in Washington: Someone willing to stand up and do what they believe is right when people all around them are yelling to do something different. You can complain about Collins and you can claim she is not a Republican, but if you do so in my presence, I will argue the point and argue it hard. Collins may not always vote the way I would like her to, but I believe she always votes the way she believes is best. So I thank her for being the one to stand in the spotlight and make the hard decisions. How many of her detractors’ names have been seen on a ballot? Delaina Toothman of Old Town is a political scientist with degrees from Texas State University and an interest in political history.